KIEV, Ukraine -- To all appearances, Ukraine’s parliamentary election on October 26th was a triumph. The poll results were promising, but the future for Ukraine is dauntingly difficult. Reformists mostly won and voters rebuked the far right and far left. Western allies heaped praise on the pro-European, pro-democratic results. Yet Ukraine remains troubled and deeply divided. In an upset, the People’s Front party of Arseniy Yatsenyuk, the prime minister, narrowly beat President Petro Poroshenko’s bloc by 22.2% to 21.8%. This means that Ukraine will keep two power centres, as Mr Yatsenyuk seems sure to stay in office. Mr Poroshenko had hoped to win a majority and install a loyalist instead. Now the People’s Front and the Poroshenko Bloc must form a coalition, probably with the third-placed Samopomich (Self-Help) party, led by the mayor of Lviv. The six parties that reached a 5% threshold will fill half of the 450-seat parliament (Rada) from their party lists. The rest will come from districts where deputies are elected directly and only later join party factions. The vote reflected the western regions’ power in the new Ukraine. Turnout was highest in the west, and relatively low overall at 52% (down from 60% in May’s presidential election). 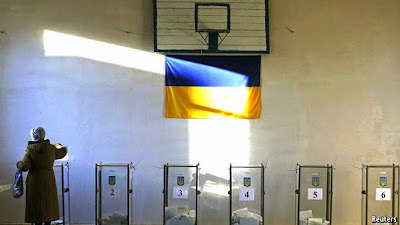 In Lviv 70% of voters showed up, against only 40% in Odessa. In Ukrainian-controlled areas of the Donbas turnout was just 32%. Neither Crimea nor the separatist-held eastern regions voted (their 27 seats in the Rada will stay empty). The Opposition Bloc, a revamped version of Viktor Yanukovych’s reviled Party of Regions, got into the Rada, after finishing fourth, with 9%. The party won much of the south-east—Donetsk, Luhansk, Kharkiv, Zaporizhia and even Dnipropetrovsk. Joining them in parliament will be some 60-70 directly elected deputies aligned with the old regime. Their presence will incense first-time politicians drawn from the Maidan movement who fought hard to oust Yanukovych. It will also upset Ukraine’s volunteer battalions, including commanders of three powerful anti-rebel paramilitary groups who were elected. Co-operation with the Opposition Bloc, which includes Yanukovych’s former chief of staff, Sergei Levochkin, will be unpalatable. But Hannes Schreiber, of the EU delegation in Kiev, argues it will be “decisive to have the former ruling side in the dialogue”. Failure to do so would increase feelings of exclusion in Russian-leaning regions, where Kremlin agents continue to sow dissent. Ukrainian security services say they detained pro-Russian “diversion groups” in Kharkiv, Odessa, Zaporizhia, Mariupol and Kiev before the vote. Even more destructive would be infighting within the coalition. Whereas the parties’ broad pro-European aims are aligned, their business interests and personal ambitions are not. Horse-trading for jobs and squabbling over reforms has already begun. Mr Poroshenko and Mr Yatsenyuk have both put forward their own proposals. Mr Yatsenyuk, who takes a hawkish attitude to Russia, has declared himself the election’s winner and put “restoration of sovereignty and territorial integrity” at the top of his cabinet’s priorities. Mr Poroshenko, who has more allies among directly elected deputies, will not easily relinquish the reins. He seems determined to direct reforms from the presidential administration, where his aides have spent months preparing draft laws, with a focus on deregulation, judicial reform and decentralisation. After the 2004 Orange revolution, conflicts between the president and the prime minister plagued the government, which squandered the chance of broad change to the system. Mr Poroshenko and Mr Yatsenyuk must learn from those mistakes. “Delay with reforms is fatal for us,” Mr Poroshenko himself said. At stake is the survival not just of the new government, but of Ukraine itself. The economy, teetering on the verge of collapse, depends on foreign aid that is linked to reforms. This week the EU promised more help. But reforms are likely only to increase the pain for people ravaged by war and facing a gas-starved winter. Ukraine has to contend with its rebels and with Vladimir Putin. The separatist republics in Donetsk and Luhansk will hold elections on November 2nd, a vote that Kiev condemns but Moscow will recognise. Ukrainian soldiers, two-thirds of whom did not vote because they could not leave their positions, still die on the front. On their way to the polls during a freezing election day in Kiev, voters expressed only tepid hopes. “The people won’t tolerate the politicians’ games any longer,” said Svetlana Ischenko, 68, in the foyer of Lesya Ukrainka Gymnasium. Unfortunately, she may be right.